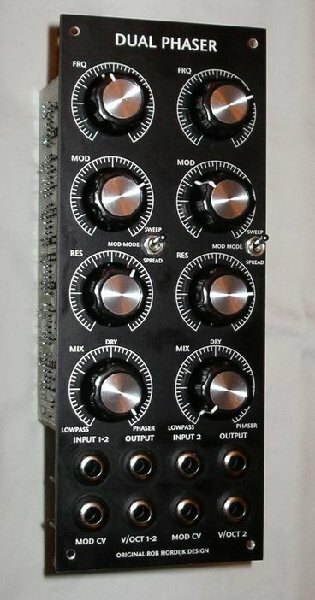 I have a fairly large Dotcom/MOTM modular synth and I have been on the hunt for some of the more unusual modules, and I have just found something really special. I have been looking at the various phase shifter modules available from different manufacturers but IMO they are all missing important features - some only do positive-mix phasing, some only do negative, some just don't sound so great. Last year I was discussing this with a friend of ours, Rob Hordijk from The Netherlands. For those who don't know Rob, he's a synth genius (check out his amazing tutorials for tips & tricks on the Nord G2 Modular) and he has now gotten interested in producing some unusual and high-quality boutique analog synth modules and his Dual Phaser module is the first in a series of new devices. 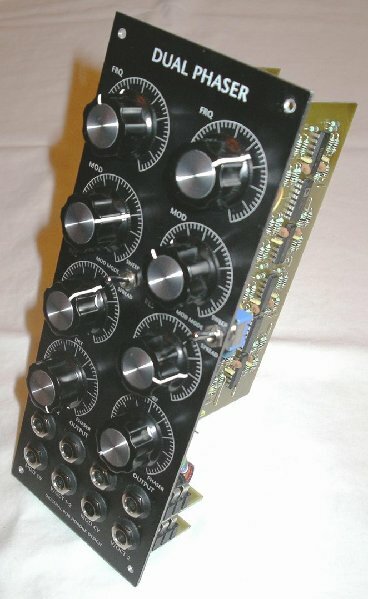 It's a double-wide MOTM format module and works with MOTM or DOTCOM power systems, and the final production version may also have Doepfer power connectors as well. It consists of two identical 8-stage phasers with some tricky routing and patching between them using switched jacks - patch audio into phaser 1 and out of phaser 2 and the two phasers will be routed in parallel but the second one will be inverted, which gives you all sorts of cool effects (more later). Also, patch a control signal into the phaser 1 1V/OCT input and nothing into the second phaser's 1V/OCT input and the first signal gets routed to both phasers' control inputs. 1. SWEEP MODE - Standard frequency sweep, like other phasers, where all peaks sweep up & down as a group. 2. SPREAD MODE - The upper peaks and the lower peaks are spread apart & pulled closer together and cross over each other ( ! ) This produces amazing vocal timbres and all sorts of complex filter effects and sounds really wonderful. 3. HALF-SPREAD MODE - the upper peaks move further away & closer to the lower peaks and the lower peaks are not affected. The MIX control is bi-polar which adds even more sonic possibilities. Set straight up at 12 O'Clock you get dry only, no phaser (bypass mode). Turn it clockwise and you increase the phaser mix, and the phased output is positive. Turn it counter-clockwise and you increase the phaser mix, but now the phased signal is inverted which sounds very different from positive phasing. The resonance control always provides positive (non-inverted) feedback, regardless if the mix control is set to positive or negative. By setting the MIX to negative and using an external feedback loop, you can easily get negative mix with negative feedback, so you have lots of sonic possibilities with pos & neg mix and pos or neg feedback. These combinations all sound different and this flexibility gives you a lot of options. I'm attaching some photos here and I'll attach some short audio clips in some follow-up posts. I'll post some dry and rather technical audio clips later, but first an example of this module in actual use. The signal is just six oscs tuned to a drone chord. You hear the oscs dry at first, then the phasers fade in. There is some chorus and reverb added to show what it sounds like in a final mix setting. I think this thing sounds amazing! These are all one sawtooth oscillator, no other filtering or any other effects, just the phaser module. And in these clips, you are hearing only ONE of the two phasers. Some clips are positive mix, some are negative. You can hear the cool vocal-type sounds created by modulating both the frequency sweep and the peak spread. I think this thing sounds amazing! it does but how come the audio file is much longer than the example? This one is dual phasers for a stereo effect, with some audio-rate modulation added for a complex growling distortion. That was my mistake, only the first clip is like that. There was an extra muted track in the same DAW project that was longer than the audio track and it caused the entire MP3 clip to be as long as the muted track. This one uses the switching jacks to patch the two phasers in parallel with the second phaser inverted. As the clips proceeds, the knob settings are adjusted to create various different types of phasing sounds. .... and this clip has the two phasers in SERIES, both set to negative phasing with lots and lots of complex sweeping from four different LFOs all at different rates (two sweeping the frequencies, two sweeping the peak spreads). Here's something unusual - using the dual phaser to create tuned percussion effects. A series of transient spikes are sent to the phasers (you can hear these at the beginning and end of the clip) and several S/H modules are modulating the phaser's frequencies and peak spreads. The feedback is increased to make the phasers "ring". ... and some phase distortion synthesis ! The audio source is just a single SINE WAVE - nothing else - no sawtooth wave or square wave. And there's no distortion or overdrive module processing the sine wave. And no lowpass filter. Just the sine wave and the phaser. The sine wave is connected to both the AUDIO IN and the MOD IN on the phaser for audio-rate modulation of the sine wave by itself, and it gets controlled by a VCA & ADSR before the MOD IN jack to control the amount of modulation. By changing the feedback, frequency, and mod depth controls you can get all sorts of cool effects that sound a bit like a distorted filter or maybe some FM synthesis. You'll hear the un-mangled sine wave at the beginning and end of the clip and lots of other sounds in the middle. This phaser sounds indeed very good. What fx box did u use for the chorus and reverb Dave? I used a Nord G2 Engine for the chorus and a Lexicon PCM70 for the reverb. So when & where will this module be available? Sorry for the late response, I was in China on a business trip from June 26 until today and was not checking this site. I don't even have a dotcom system, and I want this phaser. I've got to bump this thread because this is the sweetest phaser I've ever heard. Ever. I have contacted Rob about costs and availability and I eagerly await his response. I have just started to make the leap from Eurorack to 5U format after discovering Moon Modular's stuff. ...and I just swapped some emails with Rob the other day. Can't tell you much right now... but he's been very busy! I hope Rob doesn't mind me saying this, but rather than have lots of people ask the same question, the Dual Phaser costs 385 euro plus shipping and is available in MOTM and Dotcom format. He requests payment on completion of the module and at the moment, there is a four to five week wait. I'm sure Rob reserves the right to change any of these facts and this is just a guide - please contact him directly if you are interested. I'm going to start saving (having just spent all my pocket-money on Moon Modular stuff). 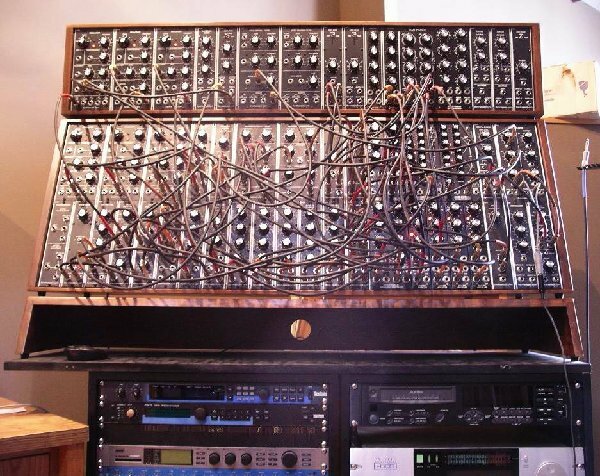 would there be any connection issues racking this up alongside any A-sys or Doepfer set ups out of curiosity ?? the clips i've heard sound great..
DotCom and MOTM (5U) are both very different formats to Eurorack (3U) (A Sys and Doepfer). 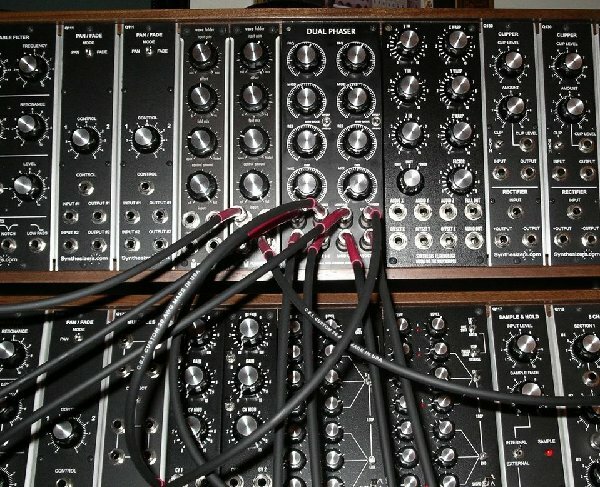 Look here for a starter http://www.modularsynth.com/chart.html. My synth has been exclusively Eurorack until now but I've recently prepared an 8 space row for MOTM format. In addition to the physical different, there is a voltage difference (±12V v ±15V). I have a homemade cabinet with lots of space so conversion was easy, but you would not be able to convert a Doepfer or a Sys case without doing some serious metalwork and electronics. ...but I think maybe your question was just about patching the two different module types together, and if that's the case, then it's simple. You'll need adapters to go from the tiny minijacks of euro stuff to the 1/4" jacks on the phaser, but it will work fine. Dose this phaser require a +5V power supply? Most dotcom and MOTM don't need the 5V supply, only some of the modules with more digital components like sequencers, clock dividers, MIDI-CV converters and the like require the triple supply.